World building is taken to new heights in this first volume of The Mirror Visitor Quartet! After a cataclysm on earth, society is now dispersed among floating islands known as arks. A young woman with the skill to read the history of objects is taken from her home to marry into another ark. Family squabbles and jealousies are manipulated by masters of illusion and mind control - to name just two of the powers - challenge her sanity and very survival. I am eager for volume 2 coming in April! Lose yourself in the fantastic world of the arks and in the company of unforgettable characters in this French runaway hit, Christelle Dabos' The Mirror Visitor quartet. Plain-spoken, headstrong Ophelia cares little about appearances. Her ability to read the past of objects is unmatched in all of Anima and, what's more, she possesses the ability to travel through mirrors, a skill passed down to her from previous generations. Her idyllic life is disrupted, however, when she is promised in marriage to Thorn, a taciturn and influential member of a distant clan. 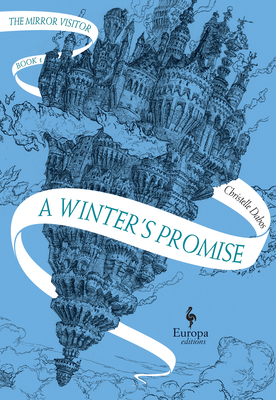 Ophelia must leave all she knows behind and follow her fianc to Citaceleste, the capital of a cold, icy ark known as the Pole, where danger lurks around every corner and nobody can be trusted. There, in the presence of her inscrutable future husband, Ophelia slowly realizes that she is a pawn in a political game that will have far-reaching ramifications not only for her but for her entire world. An unforgettable heroine, a rich and bountiful universe, intrigue and suspense: A Winter's Promise is perfect for readers of Margaret Rogerson's An Enchantment of Ravens, Melissa Albert's The Hazel Wood, V.E. Schwab's "Shades of Magic" series, Tomi Adeyemi's Children of Blood and Bone, Kenneth Oppel's "Airborne" series, and N.K. Jemisin "Broken Earth" series. I think we could have all lived happily, in a way, God, me and the others, if it weren't for that accursed book. It disgusted me. I knew what bound me to it in the most sickening of ways, but the horror of that particular knowledge came later, much later. I didn't understand straight away, I was too ignorant.